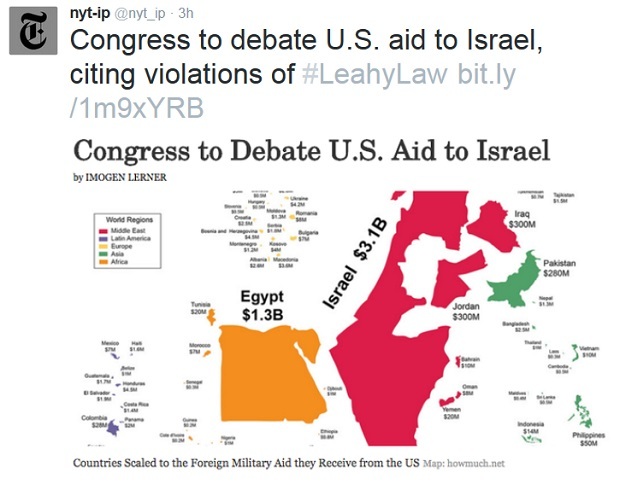 Progressive Jewish groups make New York Times parody issue to protest newspaper's "biased Israel-Palestine coverage"
"Congress to Debate U.S. Aid to Israel," reads the front page of the latest edition of The New York Times — or, rather, the latest fake edition of the Times. Activists from progressive Jewish human rights groups created a very convincing-looking fake edition of The New York Times to protest the leading newspaper's coverage of Israel. The parody publication is written from a left-wing, anti-racist, anti-Islamophobic perspective that criticizes Israel's violations of international law and Palestinian human rights, along with what the groups say is the Times' failure to adequately address these crimes. Early Tuesday morning, the activists, under the name The New York Times, sent an email out to reporters across the country titled "NYT Announces New Editorial Policy: Rethinking Our Coverage of Israel-Palestine." The email included a link to an entire website modeled on the Times' own site, www.NewYorkTimes-IP.com, which the activists created. Less than 24 hours after the site was made public, on Tuesday evening, it was taken down. It is archived here. 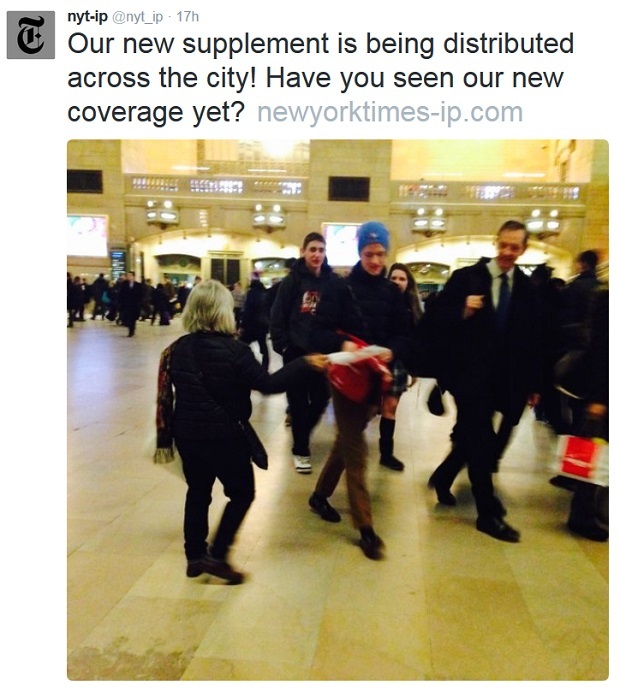 On the "NYT-IP" Twitter account the groups made, activists shared photos of them handing out more than 10,000 copies of a print edition of the paper for free in downtown New York City on Tuesday morning. This Twitter account was also suspended later that evening, but is archived here. No group immediately took credit for the action on Tuesday, while reports filled the media. Jewish Voice for Peace — New York and Jews Say No! informed Salon that they had organized the protest. The former is the local chapter of Jewish Voice for Peace, or JVP, an American human rights and social justice organization that challenges the Israeli government's continued violence against and oppression of the indigenous Palestinian people. Jews Say No! is a New York City-based peace group that, like JVP, protests Israel's illegal 48-year occupation of the Palestinian territories and periodic heavy bombing of Gaza. In December, during Hanukkah, both groups organized another campaign — a series of protests across the country condemning Islamophobia, racism, anti-refugee xenophobia and police brutality. Throughout the past few months, JVP and Jews Say No! meticulously designed the fake four-page New York Times newspaper and website. They assembled more than 20 people and created an editorial team dedicated to creating top-quality, wittily written, fact-checked coverage. 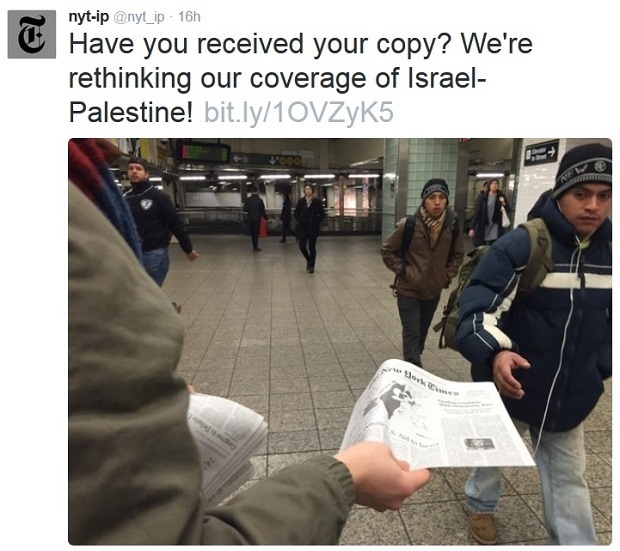 The fake "special edition" issue carries the slogan "All the news we didn't print," and blasts the Times for what the activists see as its biased, pro-Israel coverage. A piece attributed to a fake Times editorial board admits that its "sense of fairness has been absent in our paper's coverage of ongoing conditions in Israel and Palestine." It notes that the real Times regularly portrays Palestinians, but not Israelis, as instigators of violence, and uses much harsher language to describe Palestinian acts of violence. "In addition, we are aware that a disproportionate number of our news stories in the past year and a half have focused on Israeli government statements and positions or the views of Israeli Jewish citizens; only a small fraction have featured Palestinian speakers, whether officials and advocates or residents who experience the effects of Israeli policies in everyday life," the fictitious editorial states. The supplement mixes pointed satire with facts. Some of the quotes in it are fake — such as those from "Hilarity Clifton," a spoof on Hillary Clinton. Other quotes are authentic, however, such as those from right-wing Israeli Prime Minister Benjamin Netanyahu, who insists "at this time we need to control all of the territory for the foreseeable future," and "we will forever live by the sword." The front page features a large graphic that illustrates how the U.S. gives significantly more military aid to Israel than it does to any other country, at the sum of $3.1 billion per year. A satirical article depicts New York Sen. Chuck Schumer calling for an end to U.S. military aid to Israel over the allied country's human rights violations and war crimes in Gaza. The Corrections section details criticisms of the real Times' reporting. "It has come to our attention that the vast majority of articles about violence in Israel and the occupied Palestinian territories have failed to include the names of Palestinians killed by Israeli forces," the section reads. 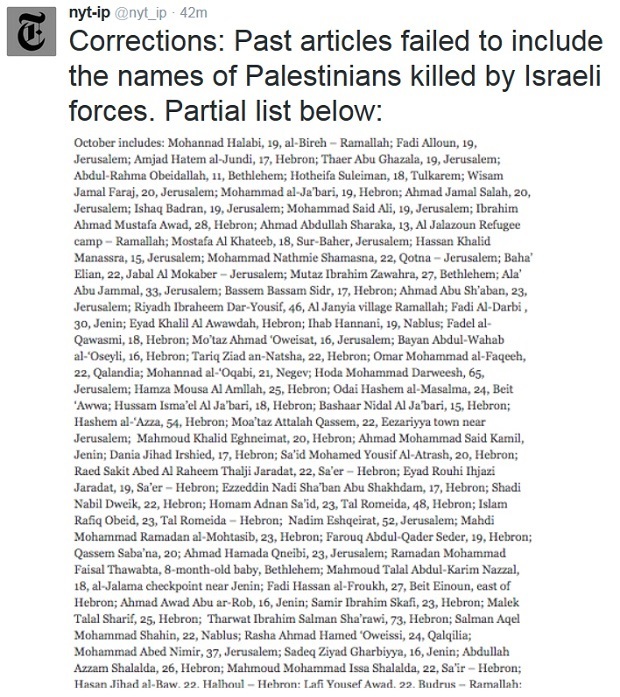 It then includes a list of the names, ages and locations of the more than 165 Palestinians who have been killed by Israeli occupation forces or settlers since October 2015. The section also criticizes the Times for running headlines that frequently obfuscate Palestinian victims of Israeli violence through the use of passive and ambiguous language. It suggests that a fictional but realistic-sounding Times article "Deadly clashes near West Bank town of Deheishe" should be renamed "Israeli forces kill 2 Palestinians in Deheishe refugee camp in the Occupied West Bank." Donna Nevel, one of the editors of the paper and a member of Jews Say No!, told Salon that they organized the protest because "We felt that it was so important." "Our goal in creating this paper was to make visible the need for reporting that addresses, rather than hides, the realities of Israeli apartheid and that is responsible and accurate in its coverage of conditions in Palestine and Israel," Nevel explained. She stressed that, in the past number of years in particular — in the wake of Israel's summer 2014 war on Gaza, in which the close U.S. ally killed more than 2,250 Palestinians, including at least 550 children, according to the U.N.; and carried out war crimes, human rights organizations like Amnesty International say — "it's increasingly apparent" that U.S. news outlets like the Times are not adequately informing the public just how brutal the Israeli occupation is. "The Palestinian story is not told," Sarah Sills, a member of JVP-NY and the designer of the print edition, said to Salon. "The media is incredibly biased in favor of Israel and I wanted to participate in creating a paper that would help rectify this egregious imbalance." Salon reached out to The New York Times for comment. Eileen Murphy, senior vice president of communications at the New York Times Company, said they "object to this group (or any group's) attempt to cloak their political views under the banner of The New York Times." "We believe strongly that those advocating for political positions are best served by speaking openly, in their own voice," Murphy added. In response to allegations of bias in favor of Israel, Murphy also referred Salon to a November 2014 statement on the topic by the Times' public editor, Margaret Sullivan. The parody publication, in full, is embedded below. Pro-Palestinian activists, journalists and progressive media watchdogs have long accused the New York Times of biased, pro-Israel coverage. The newspaper of record frequently fails to mention that the Palestinians territories have been illegally occupied by Israel since 1967. The Times also often uses euphemistic language to describe Israel's violations of international law, calling lands illegally seized by Israel "disputed." A Palestinian man told Salon in January that the Times had even edited and censored what he said in an interview in order to shine positively on Israel. Critics point to one symbol in particular that they say encapsulates the Times' pro-Israel bias. The newspaper reportedly owns an apartment in Jerusalem that is built on the ruins of a home that used to belong to Hasan Karmi, a Palestinian journalist who worked for the BBC. Karmi and his family were forced to flee during the Nakba, the 1948 ethnic cleansing in which Zionist militias violently expelled approximately 800,000 Palestinians, almost three-quarters of the indigenous population. New York Times Jerusalem bureau chiefs have lived in this apartment. Ghada Karmi, the famous Palestinian journalist's daughter, told journalist Philip Weiss, a co-editor of progressive Jewish publication Mondoweiss, that former Times Jerusalem Bureau Chief Steven Erlanger once invited her to visit the apartment, which she confirmed had been built over her family's home. On the other side, conservative, pro-Israel groups commonly accuse the Times of the opposite, claiming its coverage is not pro-Israel enough, or even anti-Israel. Right-wing organization CAMERA even goes so far as to pay for a critical billboard across the street from the Times' office. The New York Times parody, which echoes the progressive, human rights advocacy perspective, addresses many of the left-wing criticisms of the newspaper. 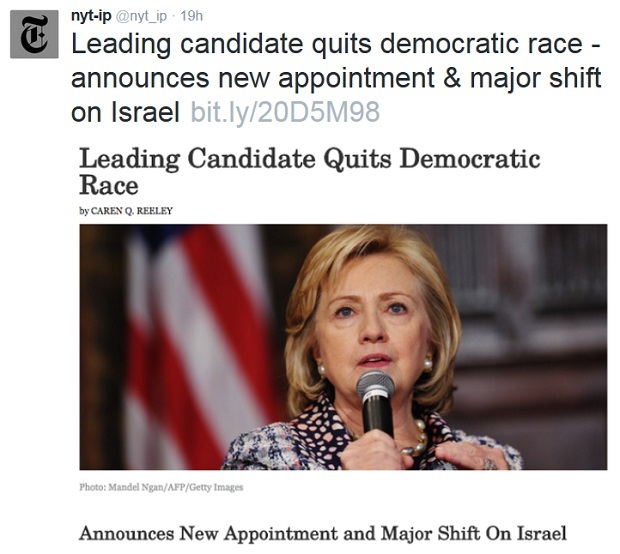 In one of its satirical articles, "Leading Candidate Quits Democratic Race," the die-hard pro-Israel Hilarity Clifton drops out of the presidential race, retires from politics and instead leads a human rights group for women in Palestine's occupied West Bank. Another article, "I.D.F. Generals Blame Israeli Government for Recent Violence," includes both real and fictitious quotes from Israeli government officials. It quotes Palestinian human rights activist Omar Barghouti — a founder of the peaceful international Boycott, Divestment and Sanctions, or BDS, movement — stating, "Those who truly wish to see an end to all violence should strive to eradicate its root causes," which he says are the robbing and colonization of Palestinian land and violent discrimination against indigenous Arabs. The fake newspaper also harshly criticizes media silence on Islamophobia. "You don't mention the rise in anti-immigrant racism," the author of an op-ed writes, blasting outlets for devoting exponentially more attention to tragedies in which Westerners die, like the Paris attacks, than to similar tragedies like the ISIS bombings in Beirut. Another piece depicts New York City Mayor Bill de Blasio traveling to Israel and condemning Islamophobia. 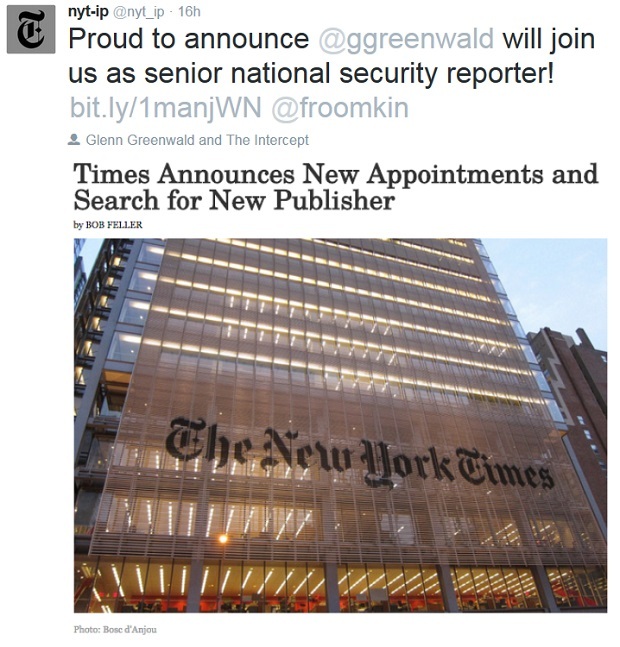 The paper jokes that it will be hiring Pulitzer Prize-winning journalist Glenn Greenwald as senior national security reporter. Even fake ads are included in the supplement, such as one for a satirical perfume called Skunk, labeled "Eau de IDF," which spoofs the Israel Defense Forces' use of toxic skunk water against Palestinians in the occupied West Bank. Skunk water has been described as "worse than raw sewage." Israeli occupation forces sometimes spray it into Palestinians' homes, breaking windows and ruining the furniture inside. People who are sprayed have the noxious smell stuck in their hair and clothes for months. Perhaps the most scathing, and comical, article is titled "Where Protests Failed, Banksy Art Frenzy Takes Down a Wall." The premise is that the U.S. ignored Palestinians when they protested for years against Israel's construction of a separation wall within the 1967 borders of the West Bank, which the International Court of Justice has explicitly said is illegal. But when prominent political artist Banksy began painting all over it, a bidding war for pieces of the wall ensued, and it was slowly taken apart and sold to art collectors for exorbitant sums. Ultimately, the activist groups told Salon they hope their protest can invigorate a debate about pro-Israel bias in U.S. media coverage. Their goal is made clear in the statement they wrote from the fake editorial board, which calls for the Times "to redress this and other imbalances."